Make Santa run as far as possible and give out presents as he goes. However, it won’t be as easy as it seems! There are lots of traps along the way, so be careful. You have to jump over the gaps between houses, avoid falling icicles and throw presents down the chimneys as you jump over them, because knocking into them slows you down. Will it be a merry Christmas with many presents under the tree? It’s all down to you! Halloween is near and also cold and spooky nights come along! Even monsters get cold at nights and have to add wood to the furnace. Be quick and avoid approaching branches! Unlock new characters and gain medals. It's time to chop! The evil Halloween pumpkins have come to life and the only way to get rid of them is by cutting them into pieces with a very sharp Katana. Prove your superb sword skills, smash them all and avoid hitting the exploding pumpkins! Just one aim: SURVIVE! zBall 4 it's the new super cool version of the classic zBall and it's full of candles and frightening surprises! Don't waste your time and enjoy the moonlight! Meet the Zombilla team! 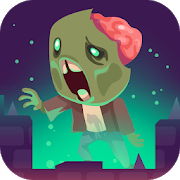 They're the only ones who can stop the zombie invasion -- help these strange creatures jump on the zombies and kill them all without touching the ground! Are you ready?